There are occasions, however, when being intentionally wrong is just fine, and just like everything else I discuss on my blog it pertains to spoken English for the most part. Also bear in mind that while you can afford using language illustrated in this article, I’m not encouraging you to adopt these mistakes as normal part of your speech to an extent that you nearly forget what the correct way of saying this or that particular thing is. But then again – it all depends on your personal circumstances. If you use English exclusively as means of verbal communication at work, for instance, and in other informal settings, and you don’t have to write or be involved where formal language is used – I don’t think your English should be judged by how grammatically correctly you speak. Yes, I don’t think you should aim for grammatical perfection because I’m a firm believer in being practical and using the English language the way you need it. You don’t have to subject your spoken English to the whims of academically minded perfectionists! One way or another, I think you should read this blog post to see which English grammar mistakes have seeped so deep into the spoken language that they can hardly be considered mistakes at all. 1. 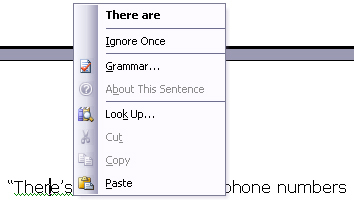 Referring to plural nouns in third-person singular of the verb ‘to be’. “Hi Michael, here’s the orders you asked for!” The grammatically correct way of making such a statement would be – “Hi Michael, here ARE the orders you asked for!” – but it’s become commonplace to use the third-person singular instead, especially after words such as ‘here’ and ‘there’. “There’s two types of free phone numbers – 1300 and 1800.” As I type this sentence, the spellchecker built into MS Word offers me to correct this mistake and of course “There ARE two types…” is the grammatically correct construct. Well, normally I wouldn’t be bothered correcting it even when writing a blog post for my website simply because it’s acceptable for spoken English, and personally I write as I speak. Writing a more formal piece would be different, however, and as I said earlier – you have to know proper grammar, but you also have to know when you can afford being selective and choose not to be 100% correct! Another example – “We’re ready to set out for a hiking trip, here’s all the things we need – a tent, a sleeping bag and canned food.” If you follow English grammar rules to the letter, you should say “… here ARE all the things we need…” In spoken English, however, it’s perfectly fine to say “… here’s all the things we need…” and it’s up to you to choose how you’re going to say it. 2. Not observing correct word order in interrogative sentences beginning with a ‘wh’ word (‘why’, ‘where’, ‘when’ etc). If I asked you which one of the following is the grammatically correct sentence – “Why it’s happening?” or “Why is it happening?” – you’d say that the latter one is the proper way of forming the question, right? I’m guessing the reason why it doesn’t sound way too wrong is because such a grammar construct does actually exist as an embedded question. If you precede the question with a few more words, it becomes grammatically correct to use the standard word order – “Can anyone tell me why it’s happening?” The reason for this is because the question becomes a noun clause within a larger, complex sentence and the reverse word order isn’t necessary in that case. “Where we’re going? I thought we had to go back home to fetch the schoolbooks and then go to the college?” If you go by the English grammar textbook, “where ARE we going?” is the grammar construct you should use. When you have a real-life conversation with someone, however, “where we’re going?” is totally acceptable because it’s much easier and faster to say! 3. Dropping the auxiliary verb “to be”, “to have” and “to do” from the beginning of an interrogative sentence. All the examples above have one thing in common – they’re statements used as questions and it’s very, very common in spoken English. In fact, one might not regard this as a grammar mistake at all if you consider that all you’re really doing is just adding a different intonation to a statement thus making it a question. “Mark got a raise” – simple statement with no emotions. “Mark got a raise?? ?” – the other person finds himself in a state of shock and disbelief; he repeats the initial statement and makes it into a question without changing the word order. which is correct “you lost” or “you’ve lost” “you won” or “you’ve won” u00a0in a game context?